Jimmy Buffet was one. The Eagles sang about them. The intrepid men (and sometimes women) who braved unpredictable associates, constant fear of apprehension and threats of violence in their daring exploits. Who were these people? Secret agents? Mercenaries? Even better. Drug smugglers! The war on drugs is simply the war on some drugs, the ones they can't patent or control, the drugs that anyone can grow at home. During the freewheeling days of the Sixties, marijuana and hashish were in high demand, and a number of dealers were willing to risk everything to supply the goods. One of the most outspoken of these entrepreneurs is author Joseph R. Pietri, whose new memoir "The King of Nepal, Life Before the Drug Wars" goes into fascinating detail into the life of a smuggler. The book, mainly written while Pietri languished in a Laotian prison, paints a vivid picture of his life on the hippie trail that led from London to Amsterdam, with stops in India, Afghanistan and Laos. It details an exciting time of exotic locations, drug-fueled orgies, brushes with the law and meetings with colorful characters like Big Eddie, Sunshine James, Afghan Ted and the Birmingham Boys. He recounts ingenious methods of smuggling weed in custom-made suitcases and in animal containers, and includes accounts of complicit governments, such as the Nepalese royal family. Marijuana was legal and even considered a sacrament in many countries until the US forced other nations to outlaw its use. The DEA, CIA and other agencies allowed the trafficking of the drug by the mujahideen to finance their fight against Communists. As a direct result, prices of marijuana and hashish skyrocketed while the price of heroin decreased dramatically. Now, Nepal is literally awash in heroin, and Pietri puts the blame for the thousands of new addicts squarely on the US government. "The King of Nepal, Life Before the Drug Wars" is a fast-paced and highly entertaining journey through Pietri’s life, where hundreds of thousands of dollars were made and lost, friends died and years were spent in prisons in foreign countries and even worse ones in America. All for a plant that the author now grows legally as a supplier of medical marijuana in Oregon! 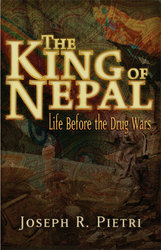 "The King of Nepal, Life Before the Drug Wars" is released by TrineDay Books, the country’s largest publisher of inconvenient truths. Joseph Pietri is available for interviews. Contact Kent Goodman at (541) 954-8142 or write to kgoodman(at)amselmedia(dot)com to make arrangements.